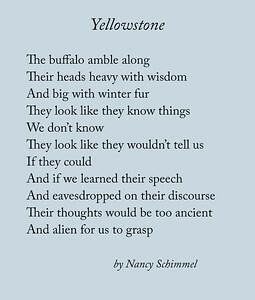 When my friend Nancy Schimmel saw my photograph of an elderly bison in the snow, she shared with me a poem she wrote, "Yellowstone," over 30 years ago. Nancy's poem brings out the richness of what I hoped to express in my photograph, and I'm very happy to share it with you here. Nancy is a very talented and prolific writer, of songs and poems and stories and more - visit her website at http://www.sisterschoice.com and you'll be lost for hours! Nancy kindly gave me permission to share her poem, written in 1979. I've paired it with my photograph, "Ancient Wisdom." An elderly bison paws through the snow in search of vegetation in the Hayden Valley of Yellowstone National Park. Photograph by Lisa Aikenhead.